Miraculously, Bailey tells his brother that Union officers were recklessly participating in horse races in the midst of the Peninsula Campaign. As we are not on the march today, I thought I may as well write a little more as not. When I stopped writing yesterday I went up to the horse race to see the fun and I found that I had to look out for No. 1 or get run over by the mounted officers for they were riding all through the crowd like the devil. Bill Gorey ¹ got run over by one of them but did not hurt him much. The officer give him a five dollar gold piece to settle it and said if that was not enough, he would give him more. That was all the accident that happened that I know of though it is a wonder there were not more. There was a thunderstorm came up and put an end to the race. It thundered & lightened most all night. I [tell] you it was awful. I thought I had seen it rain and heard it thunder in York State but I never have compared with last night. The rain poured through our tent in torrents but Dan and [I] had rubber blankets to cover our tent so we made out to keep middling dry. Today we are to have a monthly inspection of all our accoutrements and if anyone lacks anything, to supply him. The pay master is here again to pay off the soldiers in this vicinity and if you have good luck, you will get some more soap in a few days. Just before dark last night there was some twenty or more ambulances passed by here filled with wounded secesh prisoners on their way to some government hospital. You said that Ira Wait had come home. Is he at Middleville or has he gone to Chautaugua? About 3 weeks ago there was an order published that the 9th New York Cavalry were all to be discharged from the service for cowardice and the names of every one of them to be published in the papers. ² The order was read to the whole of the U. S. Army by order of Geo. B. McClellan, Maj. Gen. It is a damper on them in the eyes of the world but I don’t blame them much for bolting myself. Eveline’s husband belonged to that regiment. I have not seen him since we lay before Yorktown. Whether he is discharged yet or not, I don’t know. When the news of Gen. Banks’ being driven back reached the City of Baltimore, the secesh there could not, it seems, conceal their delight and openly expressed their opinion which made the Union boys mad so they had a general fight about it and as the Baltimore Clipper is not likely to reach you, I have cut the details of the fight out which you will find in this letter. It is bully and when you have read it, let Phil Plantz take it for he likes to read such pieces. I [can’t] think of any more to write so I will seal this letter and send it or Louisa and Frank will get tired of running to the office to get a letter from me. 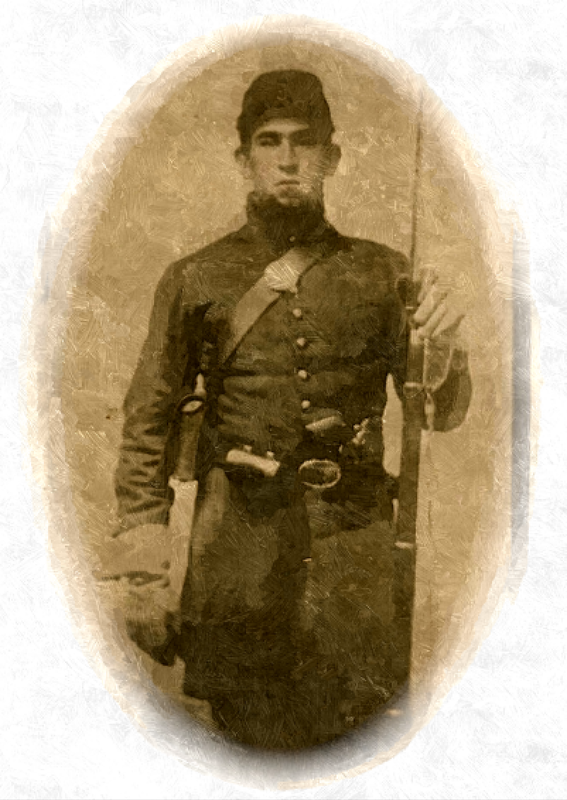 ¹ William Gorey enlisted at age 30 in Co F, 34th New York. The regimental history says that he was wounded on 31 May 1862 at the Battle of Fair Oaks — the day after he was run over by a Union officer on horseback. He was discharged for disability at Falmouth, Virginia, on 24 March 1863. ² This is a reference to the incident where the men of the 9th New York Cavalry protested their being used as infantrymen.